Janette Aston is fascinated by all things scientific, and couldn’t care less that her thirst for knowledge is regarded as unladylike by Victorian society. Enthralled by the Illuminists, a group of individuals committed to scientific discovery, she sneaks into their headquarters and is caught by Darius Lawley, an Illuminist Guardian. The attraction between the two is instant and magnetic. 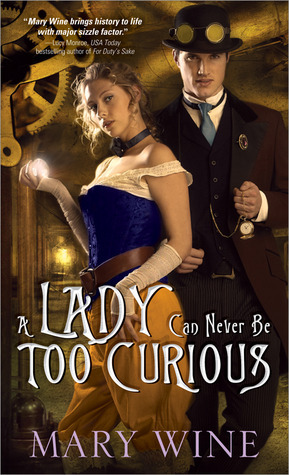 I've been wanting to give Steam Punk a try for awhile now, and this book looked really interesting. However, I've decided that this is not the genre for me. I really, really wanted to like this book. However, when I was only 20% in, I knew that I just wouldn't be able to finish it. By all means, continue to think of me as no gentleman. If ind the blush on your cheeks...charming." Outrage banished the shame flooding her. "Why, you...rogue." The door closed behind Darius, but not before she witnessed the satisfied smirk on his lips. Ill mannered, gutter hound! Insufferable man. She wasn't going to waste her time on thinking what he thought of her. But you're still disappointed he is quite out of reach. For a look at a Pure Spirit, I'd sit through tea at Buckingham Palace, boring conversation and all. But that little bit of womanhood isn't hard on the eyes, even if blondes aren't my favorites." Need I remind you that the number of Pure Spirits has been greatly reduced due to the nefarious habits of the Helikeians? If she is discovered and refuses to participate in their evil, she will be killed. This might be typical Steam Punk dialogue, but that combined with the bad formatting of the arc copy I got made this book a hard read for me, and I ended up not finishing it. I feel bad, but sadly I don't think Steam Punk is for me.